Scarce and sought-after autographed letter signed “Jack”. 1p., recto and verso, 6.25 x 9.0 inch. Congress of the United States letterhead, no date but June 11, 1951. A COPY of the original postmarked envelope is included. Letter to Colonel Joseph T. Benedict. In full: "Many thanks for fixing things at the Convention. I thought that you had an unusually fine group there and that it was a great success. I hope things go well for your ... in the service. If there is every (crossed out) ever anything I can do - I hope you will let me know -." In fine condition. 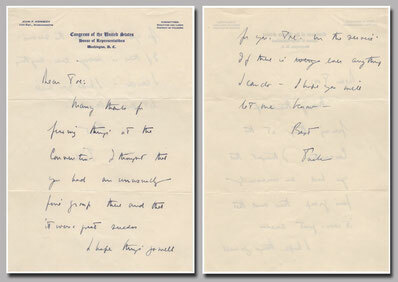 Accompanied by several copies of letters addressed between Benedict, Kennedy, and members of his White House staff, dated between 1961 and 1963. Scarce in handwritten letters. 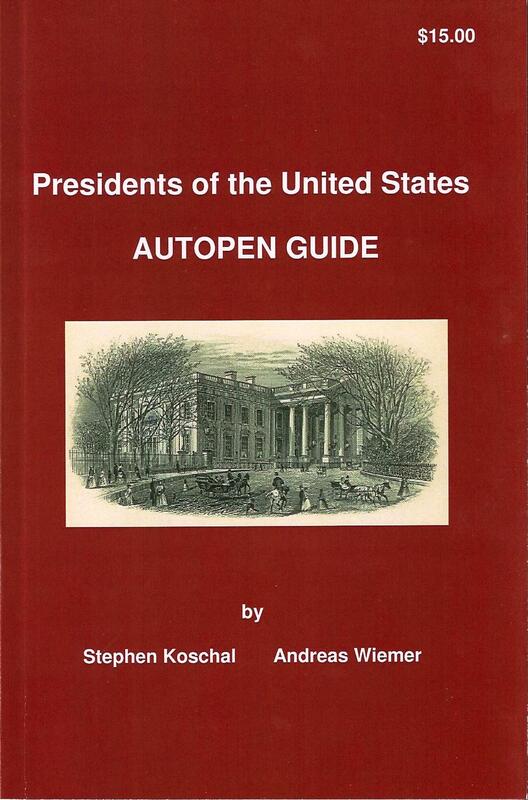 Comes together with my book “John F. Kennedy – autograph study” - about 90 pages with hundreds of signatures (authentic, secretary, Autopen, stamps, facsimile etc.). Rare early signed and inscribed glossy photograph from his first year in Congress. 7.0 x 9.0 inch, n.p., n.d. (1948), signed and inscribed in fountain pen "With warmest regards to Kenneth Browne from John F. Kennedy”. Reverse bears an affixed collector's label indicating that it was signed in 1948. The said date is consistent with my Kennedy autograph study which shows some signatures from this time. In 1946 the 29-year-old John F. Kennedy ran for the vacant 11th Congressional District seat in eastern Massachusetts. To its predominantly working class constituents - located in and around Boston, Cambridge, Somerville, Charlestown, and Brighton - Kennedy seemed like a privileged dilettante: he was young, inexperienced, wealthy, and propped up by family and political connections. Yet Kennedy successfully cultivated another image, that of a World War II. veteran sympathetic to economic and social hardship. His campaign slogan “The New Generation Offers a Leader” emphasized his age positive rather than treating it as a liability. He won the general election by winning 73% of the vote, and went on to serve in the House of Representatives until 1953, when he secured a Senate seat. 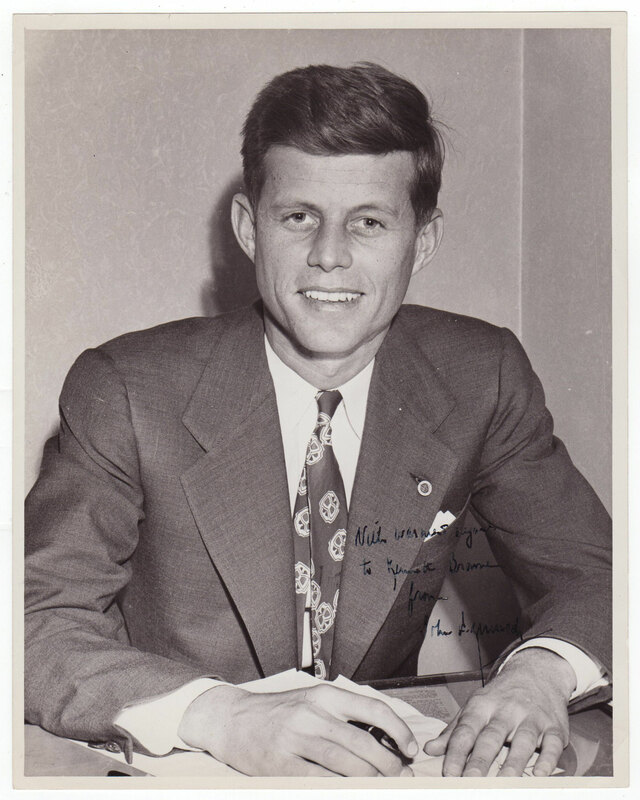 An exemplary, very early signed portrait of Kennedy as he began his career in politics and one of the finest you can hope to find. With light overall creasing, else fine condition. 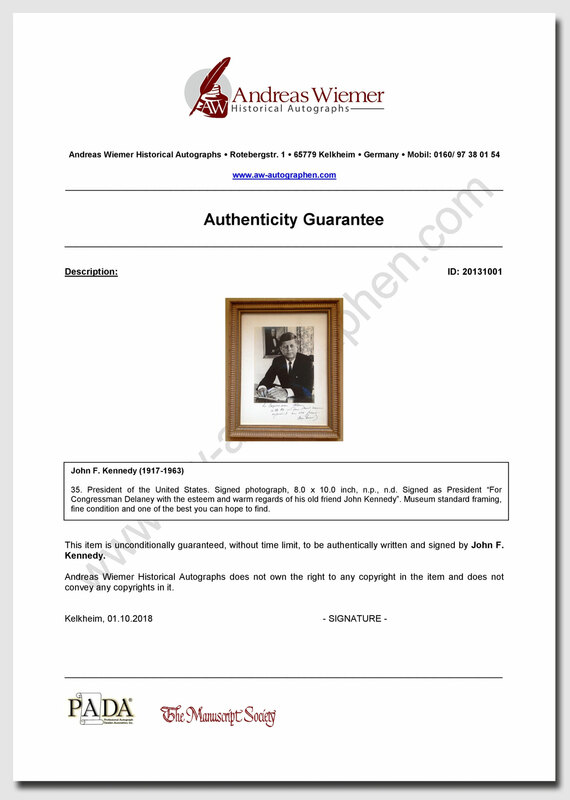 Comes together with my book “John F. Kennedy – autograph study” - about 90 pages with hundreds of signatures (authentic, secretary, Autopen, stamps, facsimile etc.). 35. President of the United States and American politician, activist, and diplomat. Signed black and white photograph. 8.0 x 10.0 inch, n.p.. n.d. Inscribed by JFK “For Charles Pell with best regards John Kennedy” in black fountain pen and similarly inscribed by Shriver “Best wishes to Charles Pell Sargent Shriver” in black ballpoint. This fine candid photograph of President John F. Kennedy and his brother-in-law, Sargent Shriver, conveys the speed and urgency with which the Kennedy Administration moved to establish the Peace Corps, which Shriver led. It shows the President in the lead, moving ahead, with Shriver following closely behind him. Upper right corner with corner wear, handling wear, else good condition. On March 1, 1961, less than six weeks after his inauguration, Kennedy established the Peace Corps by an executive order and appointed Shriver, the husband of his sister Eunice, as its director. Congress followed by formally passing the Peace Corps Act on September 21, 1961. It was the culmination of an idea that Kennedy announced during the 1960 presidential campaign. Shriver and those who worked under him fleshed out the organization’s goals and established the initial number of volunteers. Shriver later served as the United States Ambassador to France and was the 1972 Democratic vice presidential nominee, running with Senator George McGovern. Comes together with my book “John F. Kennedy – autograph study” - about 90 pages with hundreds of signatures (authentic, secretary, Autopen, stamps, facsimile etc.). Typed letter signed “John Kennedy”. 1p., 6.75 x 9.0 inch, THE WHITE HOUSE Washington letterhead, 1961 March 20. Signed by JFK in black ink. Letter to Mr. Douglass Parkhirst. In full: “It is a great pleasure for me to add my personal best wishes and congratulations to the many others you will receive on your 13th anniversary. The “Bedside Network” of the Veterans Hospital Radio and Television Guild provides wonderful encouragement and therapy to thousands of veterans in 110 VA medical facilities. Your members are to be congratulated for their generous donation of time and talent. May you continue your warmly human volunteer work in VA hospitals across the country for many more years to come.” Mailing fold, slightly discolored from prior framing, small expertly repaired tear at the top. Comes together with my book “John F. Kennedy – autograph study” - about 90 pages with hundreds of signatures (authentic, secretary, Autopen, stamps, facsimile etc.). 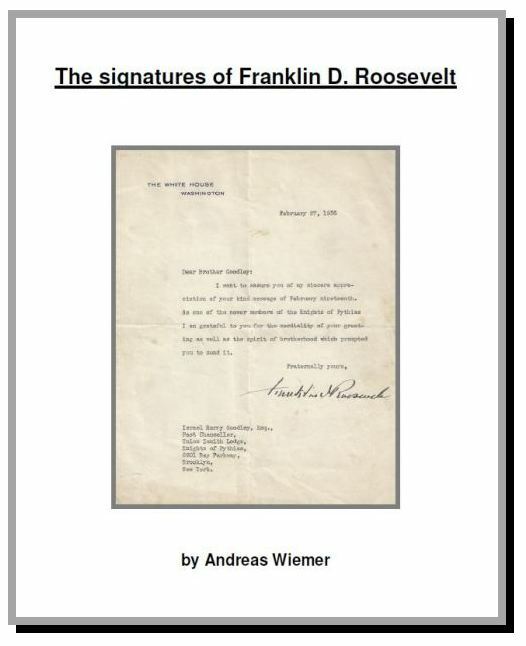 Fine letter signed as President. Typed letter signed “John Kennedy”. 1p., 8.0 x 10.5 inch, United States Senate letterhead, 1957 March 1. Signed by JFK in black ink and he adds in his own hand: “Many many thanks to you for your thoughtfulness in writing. Good Luck!” Letter is addressed to Mr. Richard Geiger in South Bend, Indiana. JFK crossed out “Mr. Geiger” to “Richard”. The letter in full: “Many thanks for your very kind letter concerning my visit to Notre Dame last Friday. Your generous comments are deeply appreciated. I was honored in being invited to address such a fine group as yours. It was for me an extremely interesting and rewarding experience, one of the most pleasant aspects of which was the opportunity to talk with so many of the individual faculty members and students. I am happy to hear that you enjoyed it also.” The original mailing envelope (with FACSIMILE free frank signature of JFK) is included. Mailing folds, lower right corner professionally repaired on verso, else fine condition. Great letter, especially with such a fine and rare handwritten postscript. Comes together with my book “John F. Kennedy – autograph study” - about 90 pages with hundreds of signatures (authentic, secretary, Autopen, stamps, facsimile etc.). Typed letter signed “John Kennedy”. 1p., 8.0 x 10.25 inch, Washington, no date. On the printed stationery of the Congress of The United States, House of Representatives, Washington, D.C. John F. Kennedy as Congressman for the 11th district in Massachusetts writes to Margaret, in full: „Since I have just returned from Europe, I have been delayed in telling you how much I appreciate all of your assistance during the past months of the campaign. I am certain that we could never have been successful against the Republican sweep if it had not been for the interest and enthusiasm of people like you. I am aware that you tackled one of the most difficult problems, and the success we did attain was certainly largely due to your efforts. I am looking forward to seeing you sometime soon to thank you personally. I hope you will let me know if there is ever anything I can do.“ Bold black ink signature by a young Kennedy who served as Congressman for six years 1947-53. Mailing folds, handling wear, else fine condition. Comes together with my book “John F. Kennedy – autograph study” - about 90 pages with hundreds of signatures (authentic, secretary, Autopen, stamps, facsimile etc.). Typed letter signed. 1p., 8.0 x 10.5 inch, Washington, 1957 February 26. On United States Senate letterhead. 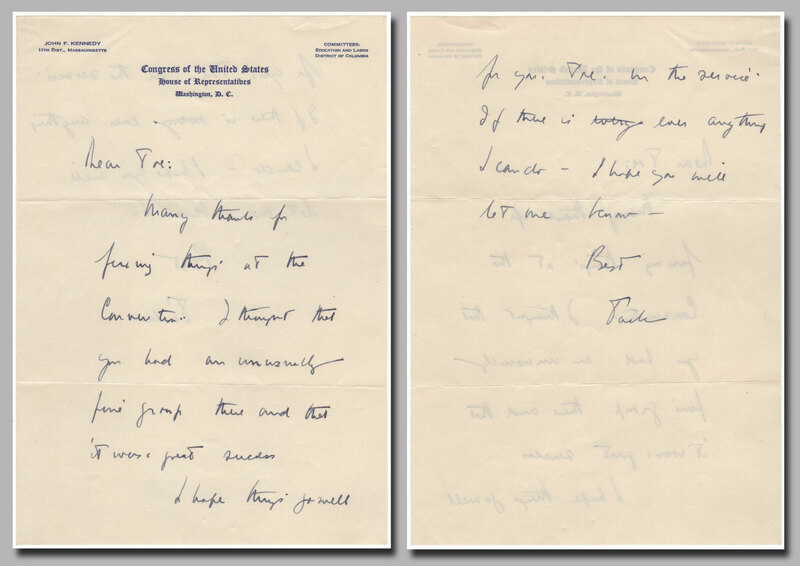 Both signed and annotated by John Kennedy as "Jack" with notes along the bottom of "Come + see us / Best to Jane", and a small annotation to personalize the letter where Kennedy crosses out the typed greeting of "Dear Mr. Jones", and personalizes it with Dear "E.N." In full: "Thank you very much for your letter of recent date calling attention to S. 625 in which a friend of yours is interested. I think the central question here is whether, as a matter of policy, the United States wishes to broaden the group of people who are entitled to receive compensation for war claims. If the decision were made to enlarge the group to include persons who were not citizens at the time loss occurred, the effect would be to lessen the amount, which could be paid to the individual claimants. At this point, since hearings have not been held on the bill, I have not had an opportunity to consider all of the factors involved. Consequentially, I am not in a position to express a definitive position on the bill. 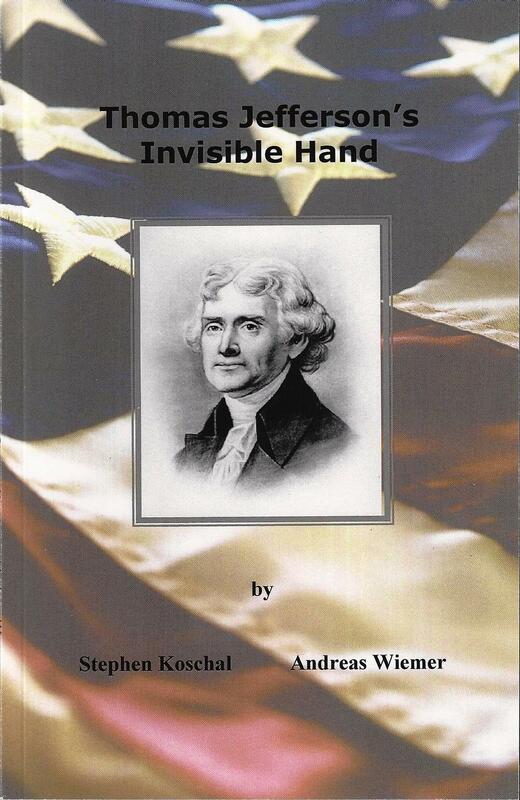 However, I want to assure you that it will receive my most careful consideration when it comes before the committee." A superb letter with fantastic content. 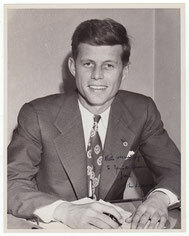 Kennedy as Senator was responding to a letter regarding a "discrimination" issue - a cause which he rose to the forefront during his Presidential administration. This letter is unclear regarding the type of discrimination however E.N Jones posed to Kennedy the question of "He is one of those being discriminated against by the original bill. From the information I can gather, it would appear that anyone who fled from Communism in the years following the War and who are now U.S. citizens anything you could do to get this Amendment passed." Accompanied by the originating lightly nicked carbon letter, 8.5 x 11.0 inch, 1957 February 13. Near fine with expected folds. A fantastic signed letter allowing one to reflect on Kennedy's thoughts on several important policies, communism, defecting and discrimination. Scarce signed and annotated with an association as shown in his autographed postscript. Comes together with my book “John F. Kennedy – autograph study” - about 90 pages with hundreds of signatures (authentic, secretary, Autopen, stamps, facsimile etc.). Menu signed “John Kennedy”. 2pp. (double page), 6.0 x 9.0 inch. Menu for the Jackson Day Dinner held on March 22, 1958. Signed by JFK in dark blue ballpoint. Additional signed by Iowa Governor Herschel Loveless (1911-1989) in blue ballpoint. Collector’s annotation under Kennedy’s signature. 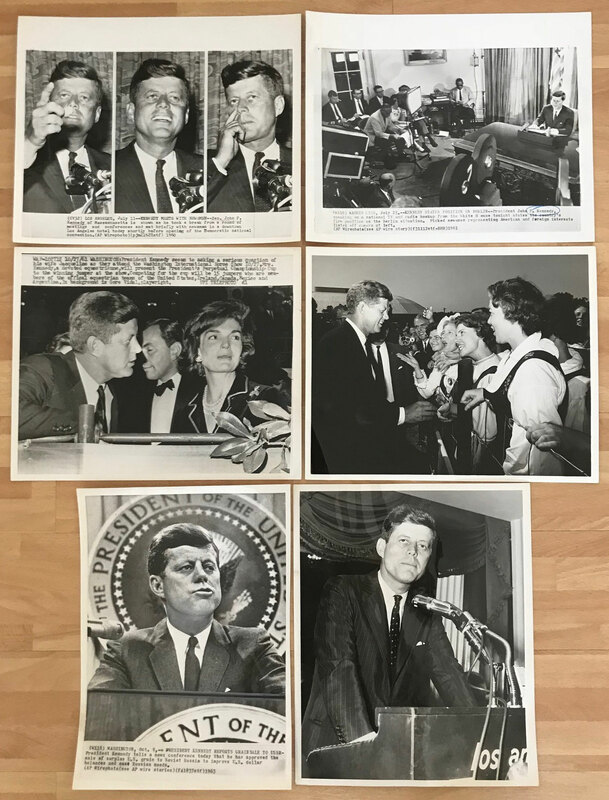 Handsomely matted in gray with a photograph of JFK to an overall of 11.75 x 15.75 inch. Both items removable affixed with photo corners. Minor handling wear, else fine condition. 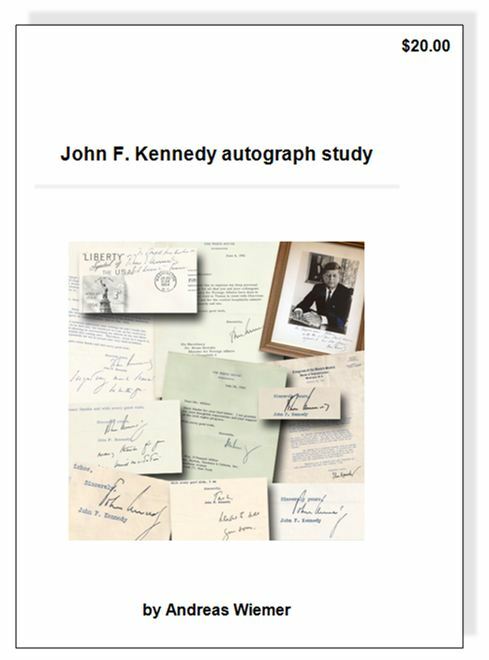 Comes together with my book “John F. Kennedy – autograph study” - about 90 pages with hundreds of signatures (authentic, secretary, Autopen, stamps, facsimile etc.). 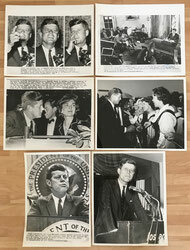 Six original black and white glossy press photos. 8.0 x 10.0 inch and one 7.0 x 10.0 inch. Unsigned! Photos taken between 1959-1963. Notes, stamps on verso, handling wear, else good condition.